They’re nostalgic, they’re fun to collect and they don’t take up nearly as much room as full-size dinnerware sets. Yes, glass children’s dishes make an ideal collection for many great reasons, and there are far more examples out there than you may have realized. If you’ve collected Depression glass in the past, you’ve probably run across junior dinner sets in the Cherry Blossom, Doric, and Pansy (example is shown here), Diana, or Homespun patterns in antique shops or at glass shows. Jeannette Glass Company manufactured these toy dishes during the 1930s and early 1940s to look very much like the full-sized versions already being marketed for family use. Collecting entire sets of these miniature dinnerware pieces makes an excellent addition to a Depression glass collection, or they can stand nicely on their own. But, they can be expensive and aren’t as easy to find as some other child-size sets. If you don’t think you can afford to collect the older toy dishes, there are some really cute reproductions made during the past 20 years that might be found more affordably at flea markets today. Some of them do look a lot like older Depression-era glass, however. It’s wise to examine pieces for clues about age and do a bit of research about reproductions before assuming all glass children’s dishes are old. Akro Agate primarily made glass marbles until the end of the Great Depression when the company began to include children’s dishes in their production lines. While they weren’t successful at first, by the mid-1940s when war efforts made other raw materials hard to get and cheap imports difficult to obtain, Akro Agate’s toy glass dinnerware sets ranging from seven to 28 pieces were extremely popular with consumers. Complete sets in the original box are prized by collectors today. Many of these miniature dishes made by Akro had a Deco influence with angular molds and stacked designs. They were produced mainly of slag glass, but some traditional Depression glass colors like cobalt blue and teal green can also be found. Akro even provided small kitchenware mixing bowls to the J. Pressman Company to be included in miniature baking sets that were just like mother’s. While the sets distributed by J. Pressman were largely unmarked, most dinnerware pieces featured the Akro Agate mark molded into the bottom of each one. Hazel Atlas Glass Co. also produced “Little Hostess Party Sets” during the 1940s and early ‘50s. Most collectors refer to these toy glass dishes as Moderntone, since they’re shaped like full-size pieces in the same pattern. Moderntone sets for kids were available in a variety of fired on colors ranging from sassy pink and black sets to pretty pastels and brighter hued sets featuring teal, gray, and rust pieces. These colors are often referred to as Platonite when full-size Moderntone pieces are marketed. Some sets have even been found in their original cartons touting them as premiums that sold for $1.37 with the purchase of Big Top Peanut Butter. This discovery helps to explain why these are still readily abundant today even though the prices are continually rising as more and more collectors snap them up. Long before the Depression era and the decades following, children were playing with pressed glass dishes that reflected adult tastes of the time. 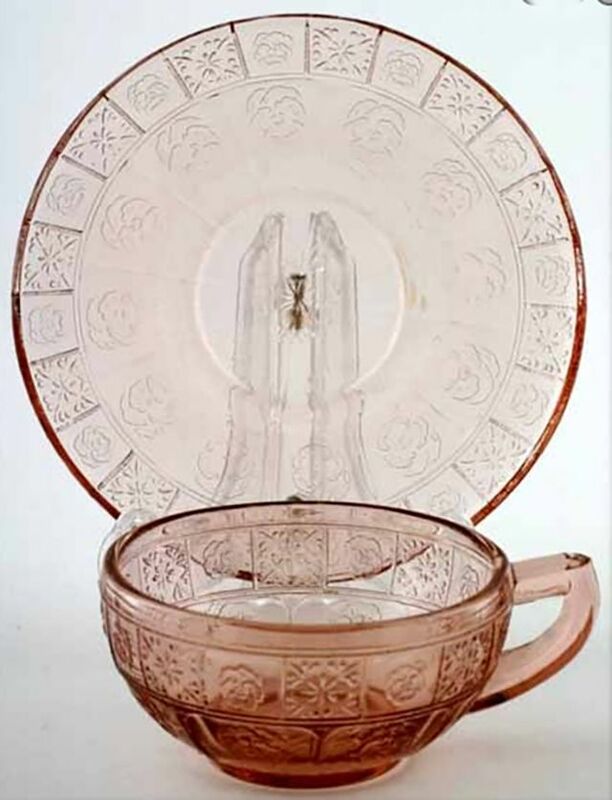 Westmoreland, United States Glass Company, and Cambridge all made versions of pressed glass serving pieces for children during the late 1800s on into the early part of the 20th century. While most were clear, some of these items came in colors like cobalt blue and emerald green. Pressed glass table sets usually included a butter dish, creamer, sugar bowl, and a spooner used to hold play-sized eating utensils. Toy glass chamber sets made during this time frame offered small pitcher and bowl sets, candlesticks, and even miniature slop jars. During the heyday of carnival glass production, Fenton also made children’s table accessories of this iridescent glass while United States Glass was offering milk glass wares in similar shapes and sizes. Although there isn’t much reference material on the market devoted to the topic today, see if you can rustle up a copy of the out-of-print title The Collector’s Encyclopedia of Children’s Dishes by Margaret and Kenn Whitmyer (Collector Books). If you’ve never given much thought to glass playthings for kids, this book will be a real eye-opener showing all the examples listed here and then some.